The Cloth Parcel is an online-based sewing, quilting, and crafting supply shop. They offer original patterns for immediate download or by mail, fabulous kits complete with everything you need, great picks of fabric on the bolt and precuts, and unique notions! The blog is a great place to check for quilt and craft ideas, quilting and sewing techniques and tutorials, and previews of upcoming products! We hope you enjoy visiting The Cloth Parcel!! 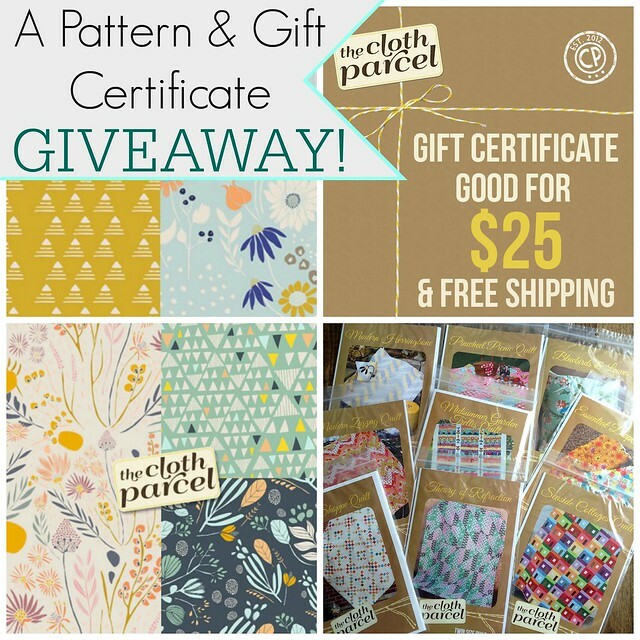 For this week's Giveaway the Cloth Parcel is offering the winner's choice of any one of their exclusive patterns + a $25 Gift Certificate to their wonderful shop!! 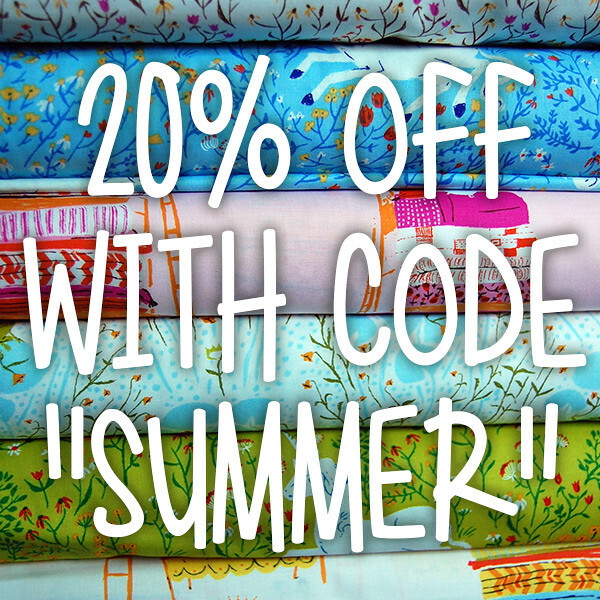 In addition, the Cloth Parcel if offering a 20% OFF special discount, now through Tuesday, June 9th! Use Coupon Code: SUMMER at checkout!! That’s 4 possible entries. Enter now through Tuesday, June 9th. The winner will be chosen by Random and I will announce their name at the bottom of this post, here on the blog. Thanks to all who enter our Giveaway! From 549 entries, this week's winner is comment #191, Amanda Best! Congratulations, I will be in touch shortly! What a great giveaway- thank you! I hope I could win! :) Great giveaway. I took a look at their patterns, I love the bluebird applique pattern and several others. I follow Cloth Parcel on Instagram. I follow Cloth Parcel on Facebook. Pretty fabrics! Must say I also like the patterns a lot. Thanks for the giveaway! I follow you on my google reader. And I already follow your blog on Feedly and on FB. Thank you for the discount! I love the Cloth Parcel! I am a Maureen Cracknell blog follower on Bloglovin'. I love that fabric and would love to win it! Only two more weeks of school! Cute fabric! A great new find for me, never heard of the Cloth Parcel. I'm adding it to my list of must shops. I follow you on FB. I love gift certificate giveaways. I follow you through Facebook! And I follow you on Bloglovin. Thanks for the giveaway. Thanks for a great giveaway chance! I follow your blog on my reader! Great combination giveaway. Thank you. They have some really cute patterns! Thank you for another great giveaway, Maureen! Following the Cloth Parcel on FB! Thank you for the giveaway! I always love to see new patterns and expand my challenges to make interesting quilts. I follow The Cloth Parcel on Facebook. Great Giveaway. Thanks as always. I follow you by Blog and FB and Insta. I shared your giveaway on FB. I began following Cloth Parcel on Instagram. Thanks. Thank you for having another giveaway from one of your generous sponsors! I now follow Cloth Parcel on Instagram - Magistra13 - and I enjoyed looking at their entries! I follow you, Maureen, on Bloglovin. I'm following them on Instagram! I just love the Seaside Cottages pattern from The Cloth Parcel. A fun pattern for the summertime! I'm following you on Facebook and Instagram! Wonderful, thanks for the chance! I wasn't familiar with the Cloth Parcel until today. Great store! Hi... entering the contest... thanks for holding it! I follow you on facebook also! Shared on Facebook on my quilting page 'Confessions of a Serial Quilter' to reach more people that way! They have a nice selection of fabrics. Thanks for hosting the giveaway, Maureen! I follow Cloth Parcel on Facebood AND Instagram. I am a follower of Maureen Cracknell Handmade. Happy to have found Cloth Parcel today! Wish I could spend a couple of hours in the Cloth Parcel shop. Sigh. Sorry, I get confused on how to enter. I follow Cloth Parcel and Maureen on FB and read Maureen's blog. I follow Cloth Parcel on facebook!!! Absolutely love that Heather Ross bundle of Far Far Away! I'm following The Cloth Parcel on Facebook. Nice! Thanks for the giveaway! I follow your blog, Maureen, and also follow you on Facebook. I follow you here and on facebook. Thank you for a such a generous giveaway Happy Friday!. What a neat online shop! I'm also a follower of yours. Follow the cloth parcel on instagram. I can really use a gift certificate! THANK YOU MAUREEN+THE CLOTH PARCEL FOR A LOVELY GIVEAWAY! Just checked out their shop, lovely selection! Thank you for the introduction to the Cloth Parcel. I took a moment to browse the shop and saw a couple of fabrics I'd like to purchase in the Witch Hazel collection. Thanks for the chance in the giveaway. I've Liked the Cloth Parcel on Facebook. I follow Maureen Cracknell Handmade on Bloglovin'. I follow Maureen Cracknell Handmade on FB. Thanks for the fun giveaway ! I follow Maureen on Facebook, Twitter, and via Bloglovin. I liked and shared this giveaway to my Facebook wall. Great online shop! Thanks for the chance to win. I follow the Cloth Parcel on FB. How cool, their patterns look really fun! Looks like a great shop! Thank you for the introduction to yet another great little shop! I follow You by email and Instagram. Thanks for another fun give-away! I follow you on Facebook and by email. I am following Cloth Parcel on Instagram now! I follow your blog via e-mail. Thank You for the Wonderful giveaway!!! The patterns looks interesting and what a great selection of fabric. Thanks. I follow right here on the blog. Thanks. Really nice fabric and a great giveaway. Thank you for another wonderful giveaway! Thanks for the chance to win. Great giveaway! Thank you for another great give-away - DELICIOUS fabric! What a great looking shop, I hadn't heard of this one, thanks I will enjoy checking out the lovely items they have! i follow the cloth parcel! I follow the Cloth & Parcel shop on Facebook. i follow you on everything! Thank you for the fun giveaway! Thank you and Cloth Parcel. Love to buy fabric! !